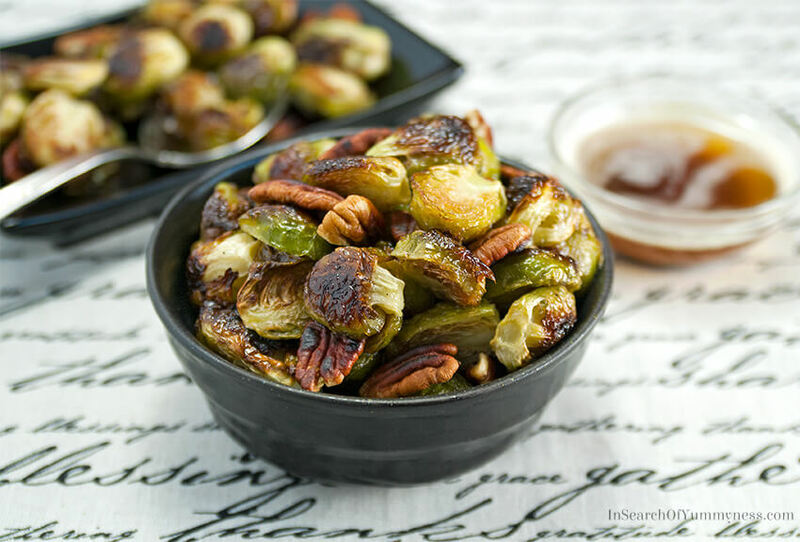 Roasted Brussels sprouts are so much more delicious than boiled ones! Roasting the sprouts gives them a nutty flavour, and it’s so easy to do. If someone had told my 10-year-old self that one day I would love Brussels sprouts, I probably would have laughed in disbelief. I hated Brussels sprouts! Well, if I’m being honest, I hated all vegetables as a kid. But Brussels sprouts were especially gross to me. My mom used to boil them (I think that’s how most people cooked them 15-20 years ago), and they just smelled like farts to me. Totally not appetizing! I don’t remember when I learned to make roasted Brussels sprouts… I’ve been cooking them this way for so long, it’s second nature to me now. Fried Brussels sprouts are even more delicious, but they aren’t exactly healthy (and frying gets messy). At least when I roast my sprouts, all I have to do is prep them and get them onto a baking tray. And I can feel good about eating them! These roasted Brussels sprouts are one of my favourite veggie side dishes, so I make them often. 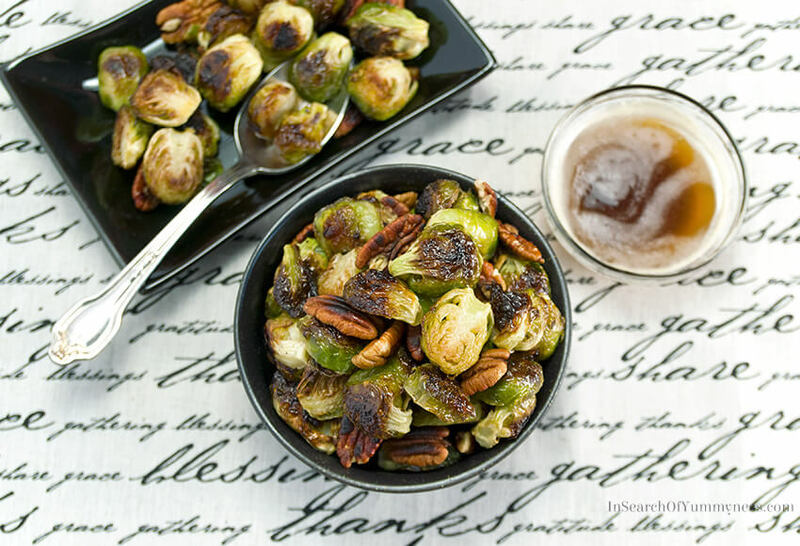 The roasting process gives the sprouts a deep, nutty, almost popcorn-like flavour, which pairs really well with brown butter and toasted pecans. I’m not going to lie, they still have a little bit of bitterness to them, but that’s what makes them interesting to eat! I learned about how bitter flavours affect our tastebuds few years ago – back when I was freelancing with Yahoo Canada. I had the chance to interview a woman named Jennifer McLagan about a book she had written called Bitter: A Taste of the World’s Most Dangerous Flavor. The book talks about how some cultures seek out bitter flavours (like radicchio and bitter melon), while North Americans seem to prefer salty or sweet flavours. She also spoke about how bitter foods like dark chocolate and craft beer were finally becoming mainstream, and people were learning to appreciate those flavours. It’s a very interesting book – I actually went out and bought a copy after I interviewed her. It made me realize, though, that I wasn’t appreciating bitterness as a flavour, and by avoiding it I was missing out on some very tasty foods. As children, our taste buds are not developed enough to enjoy bitter foods. This is why so many kids dislike veggies, because they often have bitter compounds that make them taste unpleasant. Luckily, as we get older our tastebuds change, and we can enjoy bitter foods like roasted Brussels sprouts, Campari and coffee. If you grew up hating Brussels sprouts, and haven’t given them another chance as an adult, you should defintely try roasting a batch. The worst that can happen is that you won’t change your opinion of them, but I’ve managed to convert a few sprout haters with this roasted Brussels sprouts recipe. I use to save this recipe for Thanksgiving and Christmas, because it’s a terrific side dish for turkey! Eventually, though, I started making these during the week because they’re an easy way for me to get veggies on the table. I don’t always do the whole brown butter and pecan thing though. Most of the time, I roast the sprouts on their own and just serve them as is. Much like my roasted okra recipe, these are best served hot, so I tend to eat them straight of the baking tray. That’s when they’re at their crispiest! Also, I haven’t found a way to successfully reheat these without losing the crispy bits, so I would avoid having leftovers. You can adjust the quantity of the recipe to suit the number of people you are cooking for. Just keep an eye on the sprouts while they are roasting, in case a smaller batch cooks a lot faster than the time I listed in the recipe. 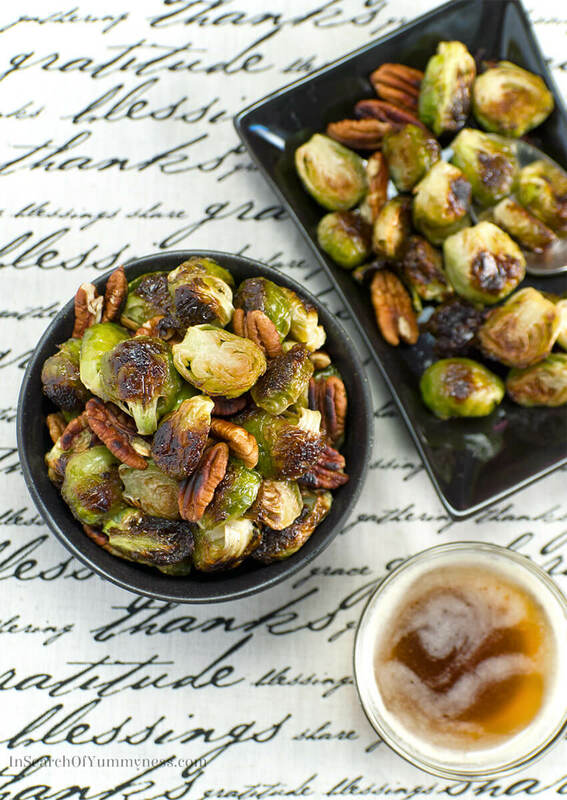 I hope you give these roasted Brussels sprouts a try – they are really tasty! If you do make them, let me know how you like them in the comments below. Roasting Brussels sprouts gives them a deep nutty flavour, which pairs really well with toasted pecans and brown butter. This recipe is an excellent side dish for Thanksgiving or Christmas! Wash the Brussels sprouts and pat dry. Remove any yellow outer leaves, and trim off the brown end of the stem. Then cut each one in half and place in a large bowl. Add the oil, salt and pepper to the bowl. Toss to coat the sprouts. Arrange the sprouts, cut side down, on the parchment-lined pan. Pour any remaining oil in the bowl over the sprouts. Roast the sprouts in the oven until they are brown and tender. This should take 25-30 minutes, depending on how big your sprouts are. Meanwhile, add the butter to a small saucepan and place over medium heat. The butter will eventually begin to foam. Swirl the pan gently and look at the colour of the melted butter. When it turns golden brown, and smells nutty, it's done. Set it aside. When the sprouts are finished roasting, pour the brown butter over them and top with toasted nuts. Serve warm. - I used grapeseed oil in this recipe because it has a higher smoke point than olive oil, and a neutral flavour. If you don't have grapeseed oil, you can use vegetable oil, canola oil or even light olive oil. I've used all of these before and they turn out just fine - the flavour is just slightly different. - Brown butter is usually made with unsalted butter, but I always make mine with salted butter because that's usually what I have in the house and it works! Boiled Brussels sprouts are the worst! My roommate used to make them that way and it totally stunk up the apartment. Not to mention they taste so unappetizing. Roasted is a whole different story. And I love the idea to serve them with browned butter – delicious! Thanks Chelsea. Yeah, I’m not a fan of eating them boiled… steamed is ok, but boiled is just not my thing LOL. Hi Shareba, I think most people would agree with you there on the likelyhood of wanting brussel sprouts. Love the way you described them as farts not appetzing at all. But I think you have redeemed this creature from the abyss of the earth by first of all roastying them but then add in the flavor of brown butter and walnuts and you have a flavor profile that could win the hearts iof many. Afterall we are foodies with complex pallets are we not?